Gorgeous white classic cut baby bib with broderie eyelet floral lace pattern on the front and trimmed in white lace. Ties around the neck and measures approx 16 x 18 cms. 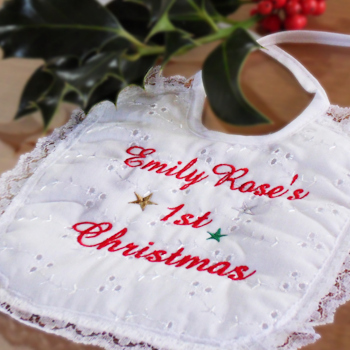 1st Christmas is embroidered along with babies name you fill in. We will sew the personalisation in festive red thread and decorated with tiny Christmas stars. Lovely Celebration Christmas gift for baby!